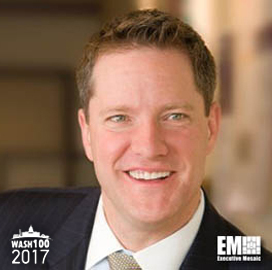 Executive Mosaic is honored to announce Scott McIntyre, president and CEO of the public sector business at PwC, as an inductee into the 2017 edition of the Wash100 — Executive Mosaic’s annual selection of influential leaders in the government contracting arena. In his role, McIntyre leads a business that works to provide management consulting support to federal, local and state government agencies. In January of this year, he was elected to the board of directors of the Foundation for the Malcolm Baldrige National Quality Award, a private-sector partner of the National Institute of Standards and Technology’s Baldrige Performance Excellence Program, and started his two-year term. He led PwC’s Public Sector Baldrige Journey program, which received the 2014 Malcolm Baldrige National Quality Award. In September 2016, IDC MarketScape recognized PwC as a leader in systems integration in support of the U.S. federal government. In 2015, he was named to the Consulting magazine’s list of the top 25 consultants in acknowledgment of his leadership in the public sector. McIntyre is a 12-year PwC veteran and previously served as managing partner for the global public sector and account leader for the Defense Department. He joined PwC in 2004 after a prior role as vice president and managing director at BearingPoint. McIntyre also spent a decade at KPMG as a principal and three years at Vredenburg Corp. as program manager for electro-optics systems. He is chairman of the board of the Prevent Cancer Foundation and a member of the audit committee of The Langley School.